What: Palpable audio-simulcra of the life and work of the evolutionary other as abstract-figurative rock and roll ranter and shouter. Anti-particular poetry, melted clockwork musical composition, projective radio painting, aphoristic cave illustration, and other self-invented anti-art genre will be examined under a Maldororain Micro-scope. In-coming phone-calls will be able to travel by osmosis. The full text of the show was available in a limited edition booklet of 30 signed copies when the two cassette version was released. There were 70 copies of the booklet printed. 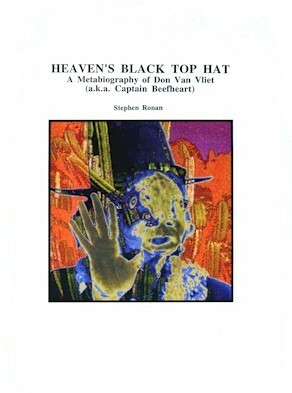 The title ‘Heaven’s Black Top Hat’ comes from one of Don’s poems, Manta Ray, which is printed on the reverse of the booklet’s title page. If you want to hear Don’s music, or you want a potted history of the Magic Band then you will not get it here! There is plenty of music in this bizarre show but it is usually several tracks mixed on top of each other creating a fascinating sound collage, and the ‘metabiographical’ information is surreal and impressionistic rather than exact and verifiable. Well, Don did elaborate his own history so OTE are only taking this a step further. Some parts do falter which is not surprising due to the length of the piece and the fact that some of it was improvised. The poems (by Stephen Ronan) are pretty close approximations of Don’s style and stand on their own merit rather than as imitations. Overall it’s well worth a listen! Don Joyce, who died in 2015, was a longtime host of Over The Edge and was also a member of Negativeland. and also from the OTE website (now defunct). It’s now quite a rarity!